There are many different kinds of foam with different purposes. When looking for an upholstery foam, you’ll find several densities, sizes, and thicknesses from 1 inch to 6 inches. You can also get bolster foam and wedge foam. So what’s the difference difference between high density and medium density upholstery foam? It’s common to think that a foam’s density would relate to how firm it feels, but that’s actually not the case. Density correlates to the foam’s durability. High and medium density foams feel the same when you sit on them, but high density foam has longer longevity. 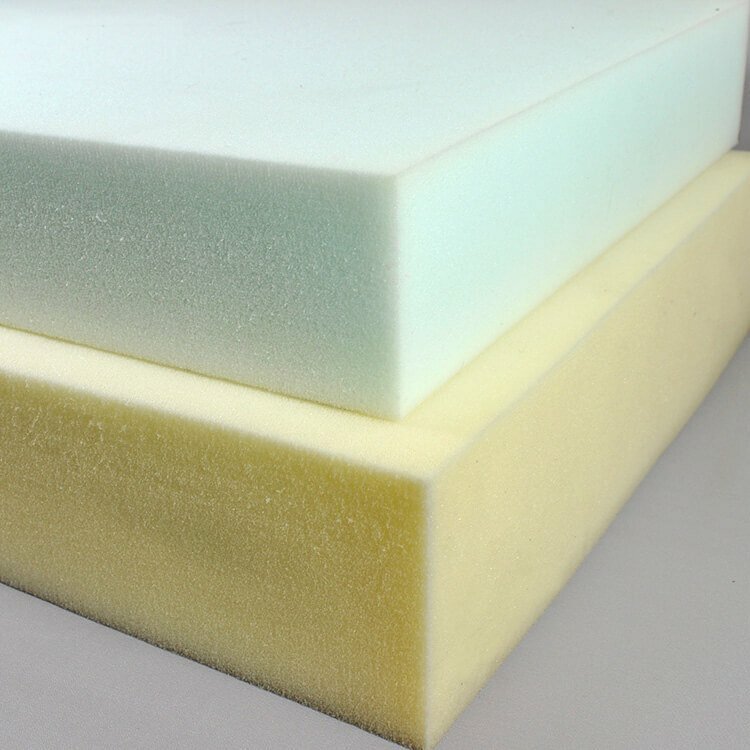 For foam that will get heavy daily use, like couch cushions, dining chairs, or mattress toppers, high density foam is the better choice because it will hold up over time the best. But for light or occasional use, medium density foam will be sufficient, like for accent chairs and headboards. If using foam outside or for an application that could get wet, like patio cushions or boat cushions, you’ll want an outdoor foam. If you want to use foam outdoors, you can’t go wrong with Eva-Dri or EZ-Dri outdoor foam. They’re both medium density, but they are designed to let water flow through them rather than absorbing it like a sponge. The open cell construction also lets humidity and moisture evaporate quickly. EZ-Dri foam also has a built in fungicidal additive that inhibits fungus and mildew. This will help prevent stains and odor. For a firmer foam that’s very durable, try rebond foam. It’s a dense, open cell foam that provides solid support and holds its shape well. The 3 inch thickness is good for automotive seats, office chairs, and bar stools. Foam will be shipped to you rolled up tightly. After you unroll the foam, please allow up to 24 hours for the foam to expand to its correct dimensions. Once the foam is exposed to air, it will start to yellow, so don’t be concerned when this happens. Foam can easily be cut with a serrated knife, or even an electric knife. For a professional foam cutter, there’s the Acu 350 Foam Cutter, which has two blades to produce a fine, reliable cut. See our video on how to cut foam. For more complex shapes and layering, you can use spray adhesive to bond the foam together. Try Clearco 444 Upholstery & Foam Adhesive or 3M Foam Fast 74 Spray Adhesive. You can also use these spray adhesives to attach padding or upholstery batting to the foam to make cushions and headboards softer and more rounded. See the following tutorials that use foam for more tips on cutting foam and using for upholstery. See our selection of upholstery foam here. I have some old foam, it is like 3 years old. Would it still be good to use or does foam go bad after a few years? BEST ANSWER: Foam does degrade over time, but 3 years shouldn't be a problem at all. Foam turns yellow as it oxidizes but this doesn't affect the functionality. What kind of foam do I use for my back loose cushions for my sofa? They are stuffed and look slouchy. I think a wrapped foam would be better. BEST ANSWER: Yes, high density upholstery foam wrapped with Cushion Dacron Wrap is a good option. You can add more than one layer of the cushion wrap if needed. What is the best foam to use for back cushions on my sofa? They are separate rectangular pillows and I hate the slouchy look. BEST ANSWER: We suggest high density upholstery foam. You can wrap it with Dacron Cushion wrap one or more times to make it softer and more rounded. Can you use memory foam for outdoor cushions? BEST ANSWER: You can if they're not going to get wet or you cover them with a waterproof fabric. Otherwise we suggest Eva-Dri or EZ-Dri outdoor foam. I am doing a victorian sofa i want to put a heavy foam because it is used alot,can u tell me wat foam to buy thank u? Which thickness you choose depends on what would look best with your particular sofa. What is this foam made of? BEST ANSWER: The upholstery foam is made out of polyurethane. What type foam would you recommend for a futon? I want to make a boxed square cushion to take to my crochet club. All they have are folding chairs and they are very hard. I am a heavy woman and i don't know which foam to buy? All help is greatly appreciated. BEST ANSWER: Hi Gwen, if you're going to be using the cushion a lot, the high density upholstery foam would have the most longevity. A thickness of 3 or 4 inches would be a good amount of cushion. I have a roll of 2” foam to make a bench pad. The trouble is the end of the foam inside the roll is all scrunched. How do I get it to expand to the 2” height? BEST ANSWER: Give the foam at least 24 hours to fully expand. BEST ANSWER: We suggest the 3 x 24 x 54 High Density Upholstery Foam. The 2" or 4" thicknesses would also work. Which foam would be best for dog beds? What sponge can I use to fill a bench cushion please needs to be rectangular please?